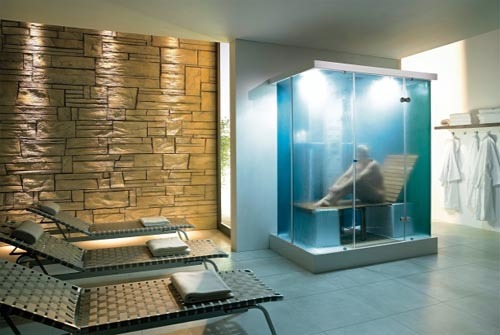 If you have ever been a member of a good health club, used a health spa, or better hotel, you may have had the opportunity to use a steam room. These rooms heat up water to a steaming temperature and release it around the room. The steam relaxes your muscles, opens your pores, and can do wonders for clogged sinuses. It is such a wonderful experience, that many people are remodeling their bathrooms to use this technology at home. In addition to a sealed shower enclosure, you will need to install a small steam generator and a steam releasing aperture (similar to a shower head, but for releasing the steam). Cold water is pumped into the steam generator, heated up, and delivered into the moisture sealed enclosure. To activate you simply walk in, close the door, sit down on the built in bench, press the “on” button and adjust the temperature. Some systems can also include mood lighting and an mp3 player for soothing music of your choice. The cost to build a steam system is typically $2,500-$5,000 depending on the quality of equipment and whether you get mood lighting or a music system installed, plus the cost of a new, sealed shower. If this sounds like a lot of money for a fancy shower, keep in mind that total bathroom remodels cost $15-20,000, so cost-wise this is not a huge luxury add-on. The operational costs are low enough to be considered “green,” as a 20 minute steam only requires about 2 gallons of cold water, compared with about 50 gallons for the same length of shower using hot water. Your electric bill might go up a bit to operate the generator. While many people appreciate the relaxation of a soaking bath in a deep tub, many people say they don’t like baths because they sit in dirty water. Steam showers are a great alternative because they provide the relaxing, penetrating heat and moisture without the soaking. They are also good for active people with sore muscles, acne sufferers (steam opens the pores and allows oils and dirt to escape), and seniors having difficulty getting in and out of tubs or that are concerned about injury due to falls. This entry was posted in Alno, Americh, Aquabrass, contemporary, Duravit, eco-friendly, Feng Shui, Ginger, Graff, Hamat, Hansgrohe, Hastings, Herbeau, hydro systems, Kaldewei, Lefroy Brooks, luxury, modern, MTI, Newport Brass, Porcelanosa, Samuel Heath, Showers, Sienna, spa, Stone Forest, Sunrise, timeless, Valli &Valli, Vola, Watermark, Whitehaus, Zen and tagged Bathroom, iBathTile, luxury, remodel, showers, steam showers by iBathTile. Bookmark the permalink.